It’s a little hard to put to words an exact description of Battle Chef Brigade, but let’s see if I can pull it off. It’s Iron Chef, set in a quaint Parisian watercolor, with elements of match-three games and Ranma ½. You got all that? OK, moving on. Battle Chef Brigade is goofy and endearing in both premise and presentation. As Mina, the player leaves home to enter a national cooking tournament, with the aim honing their knowledge of cuisine while training and refining their combat skills. Each morning, she arises to train and challenge her fellow chefs, taking on daily puzzles and mini-tasks that teach and reinforce new techniques to use in battle. While in competition, Mina is tasked not only with cooking the best, highest-scoring meal possible, but also hunting and gathering the necessary ingredients by killing monsters. Each segment is timed, and additionally has other goals or tasks to complete to improve the meal’s score, from using specific items in the dish, to racking up the correct amount of combos to spice the meal according to the judge’s preferences. As a “match-three” game, Battle Chef Brigade goes above and beyond the call. Anime characters are superimposed on soft backgrounds featuring wet washes of paint pooled over textured paper, set to a lilting orchestral soundtrack not unlike a Miyazaki score. The combat segments, which from a distance may seem tacked-on, are not only well-incorporated mechanically, but also provide immense satisfaction with the fluidity and power of Mina’s attacks. Despite the time limit on each battle, the back and forth between two sources of panic—quickly cooking a dish to the judge’s specifications versus killing monsters for key ingredients—is actually pretty fun. The complexity of solving puzzles contrasts the no-brain hacking and slashing for a very welcome change of pace. The match-three gameplay is also strongly enhanced by some of the thematic elements added to increase the challenge. Instead of just matching three gems (or rather, ingredients) and clearing them off the board, various culinary techniques are incorporated to add new strategy, for example, using a slow cooker to upgrade certain gems for a better score, or using a cutting board to cut out gems that are in the way of a superior combo. 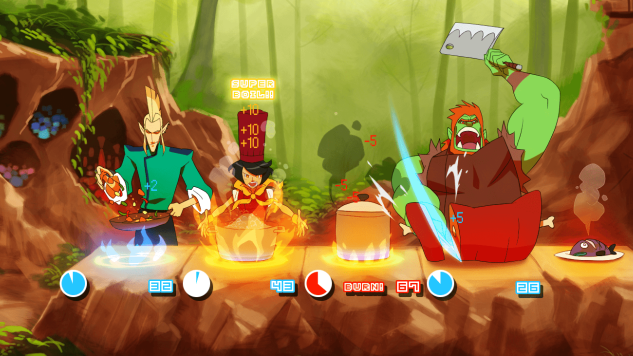 The game borrows heavily from reality cooking show competitions in format, and that’s probably the part I like best. It leaves the writers plenty of room to introduce interesting characters and write hilarious dialogue, both of which I enjoyed as much as the action. There are some truly laugh-out-loud funny moments hidden in the conversations Mina has with her competitors, trainers and other folks the player meets along the way. I’m playing Battle Chef Brigade on the Switch, which means it essentially feels like a mobile game. In mobile game design, developers and publishers have been chasing the Candy Crush Saga money train for some time, so I’m surprised but delighted to see such a refreshing spin on the (and I use this word loosely) genre. My husband likes to play match-three games like Puzzle Quest in bed after I’ve gone to sleep and my honest hope is that he starts playing Battle Chef Brigade soon so I don’t have to be so embarrassed by his gaming tastes. It’s stuff like that that breaks up a marriage. Jokes aside, Battle Chef Brigade is pure fun, which as this horrific year wraps up and I throw myself into epic holiday preparations, is just what I needed. With its anime sensibilities and a play style that even my mom likes and appreciates, I suspect it will have strong generational appeal and make for a great family game. I can’t recommend it enough. Battle Chef Brigade was developed by Trinket Studios and published by Adult Swim Games. Our review is based on the Switch version. It is also available for PC.